Professor Lars Coenen is the inaugural ‘City of Melbourne Chair of Resilient Cities’. 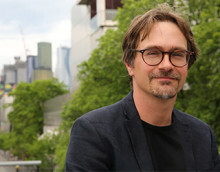 Lars seeks to strengthen Melbourne’s role as a leader in knowledge based urban resilience and leverage opportunities for collaborative research between universities and cities. Lars is an interdisciplinary scholar cross-cutting the fields of innovation studies and economic geography. He is well-known internationally for his work on regional and urban innovation and, more recently, for his pioneering research on the geography of environmental innovation and sustainability transitions. His research interests converge around the geography of innovation: where does innovation happen and why there? What makes cities and regions innovative and to what purpose? What is the role of policy to foster place-based development and innovation?